The Wallabies player was detained on Saturday, along with another man, after being found with a white powder, broadcaster ABC reported. 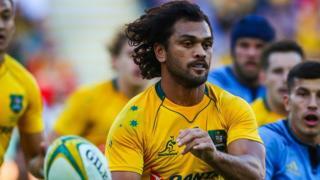 In a statement, Rugby Australia (RA) said it had been "made aware of an incident involving Wallabies and Queensland Reds back Karmichael Hunt in Brisbane". "Rugby Australia takes all matters relating to the off-field behaviour of its players seriously and has commenced an investigation into the incident in conjunction with the Queensland Rugby Union," it added.